A tube station is a place where people can board and disembark trains. It’s a functional, sometimes crowded and most times a windy place. What is intriguing about a tube station is that in busy, fast-paced London, about 40 tube stations–some of which still stand–have been abandoned, and they haven’t always been used only for transportation. The reasons for their disuse vary, from too few passengers to rerouting of the lines. Although these stations have closed, their histories are still relevant; several stations served purposes other than simply being hubs for transportation. Strand Station, which was renamed Aldwych Station in 1915, was used as a storage space during wartime in the first half of the 1900s. It housed artifacts from the National Archives during the First World War and from the British Museum in the Second World War. Though it was closed between 1940 and 1946, it functioned as an air raid shelter. Aldwych reopened July 1946, but was closed permanently in 1994 because of its high cost and low traffic. 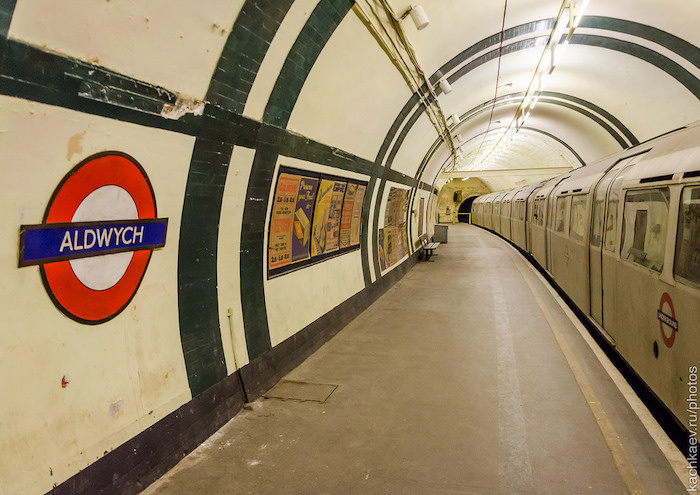 Since then, the station has been used as a set for films such as ‘28 Weeks Later,’ and it is open for tours as a part of London Transport Museum’s Hidden London programme. Another station underwent major renovations to suit the needs of people such as Winston Churchill during World War II. Down Street Station, which was closed in 1932, was used by the former prime minister and his War Cabinet as a bunker during the Blitz. But the military and political leaders didn’t huddle together quietly while bombs dropped overhead–they converted platform areas into offices, dormitories, loos, showers and even a lift. After Churchill moved into the Cabinet War Rooms complex, the railway executive committee began utilizing the space to make sure trains would keep running throughout the war. In another disused tube station, military personnel worked to manage war operations that occurred way above ground level: in the sky. Designed by Leslie Green, Brompton Road Station was a command centre for anti-aircraft batteries. It was closed in 1934 after it was decided to be financially not feasible and sold to the War Office four years later. But the Ministry of Defence kept it long after the war ended; they didn’t sell it until 2014, for £53 million. St. Mary’s (Whitechapel Road) Station was a refuge for civilians during the war. It was closed in 1938 and left dormant for two years. Although it was bombed in 1940 and 1941, the air raid shelters were still used, containing bunks and a ventilation system that removed air from the inside and brought fresh air from the outside underground. After World War II, the station fell into disrepair and was abandoned. St. Mary’s Station is only a few meters below the surface, yet many people are unaware the tunnels still exist. It’s clear that London’s public transportation has changed over the years. Since the Metropolitan Railway opened in 1863 and became the world’s first underground railway, trains have become electric, the circle logo has been adopted, and the famous tube map has been created. Tube stations that have been trimmed from the lines are another signal that the London Underground is constantly evolving and adapting to the needs of the time. Today the tube needs to be faster and more convenient, so Crossrail Limited is working on just that. The Elizabeth line, which is scheduled to open this autumn, will continue the long-standing tradition of the changing of the tube. Yes, tube stations are practical for their roles as transportation hubs, but they can also be used to do things like protect people, organize military operations and store priceless artifacts.